Originally a Dacian settlement, later incorporated into the Roman Empire, Sebes (Mühlbach in German), was settled by the Saxons in the 12th century. 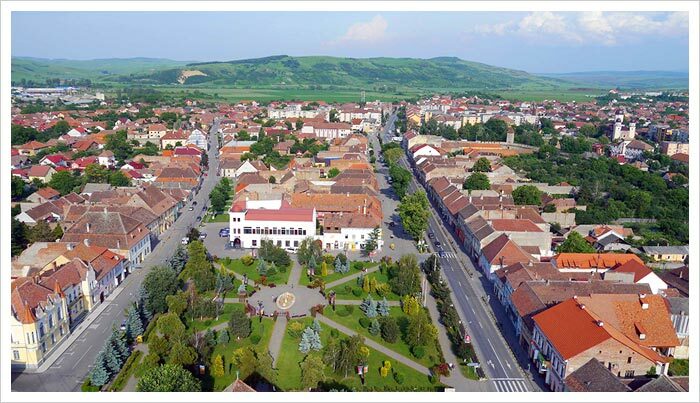 First documented in 1245, Sebes flourished economically and politically during the middle ages, serving as an administrative town for the region for more than five centuries between 1308 and 1876. The Transylvanian Diet met in Sebes in 1546, 1556, 1598 and 1600. The site of the meetings, the Zapolya House, is now a museum. The city's name comes from the Hungarian word sebes, meaning 'fast', and refers to the river that flows through the city. The German name Mühlbach stands for 'mill river' and refers to the hydraulic mills that were built along the river. A renowned craft and trade center, Sebes was home to some 19 guilds – among them the armor-makers, tailors, blacksmiths, furriers, shoemakers, bakers, potters and drapers – which conducted business with the province of Walachia, as well as with central and western European cities. The downtown area of present-day Sebes, lined with colorful high-roofed 18th and 19th century Transylvanian houses, has preserved its medieval feel. Open: Mon. – Sun. 9:00 a.m. – 5:00 p.m.
First built as a Roman Basilica in romanesque style, the church later took on a gothic appearance with renaissance elements. Only the nave has been preserved from of the original church built between 1240 and 1270. Throughout the centuries, gothic elements were added to the structure, such as the richly decorated choir built between 1361 and 1382. The Evangelical Church in Sebes boasts the largest altar of all churches in Transylvania. Richly decorated with paintings and carvings, the polychrome wooden altar was designed between 1518 and 1526, marking the transition from gothic to renaissance style. The church was repainted in 1752 and again, in 1904. In the late 18th century, an organ made by Master Johannes Hahn of Sibiu was placed below the belfry. In 1893, it was replaced by a new organ made by the brothers Rieger of Jagendorf (Silesia). St Jacob's chapel, on the north side of the church, was built in gothic style in the 14th century. Images depicting the lives of St Francis of Assisi and St Nicholas are still visible on the murals. Tailors' Tower is also known as the Student's Tower. Legend has it that when a Turkish army attacked the town in 1483, a couple of the locals refused to surrender and barricaded themselves in one of the towers of the citadel, namely the Tailors' Tower. The Turks conquered the tower and burned it down. The only survivor was a 16-year-old boy, a student at the German school in Sebes. Taken prisoner by the Turks, he managed to escape after 22 years of imprisonment and fled to Rome where, in 1475, he wrote a book in Latin entitled About the Turks' Religion, Manners and Evil Deeds. The work was signed The Nameless One of Sebes. The book enjoyed tremendous success throughout Europe, being printed in no less than 25 editions until 1600. The 1530 edition was prefaced by Martin Luther himself. The first written mention of the Sebes Fortress dates back to 1387 when construction began. Damaged by invaders, it was restored in 1571. Stone-block and brick walls with eight towers were added to the original rectangular precinct. The one-mile-long walls with battlements, ramparts and openings (used to pour hot tar over assailants) have been preserved and can be seen even today. The guilds in Sebes built eight towers; only two, namely the Shoemakers' and the Tailors' Towers, though partially ruined, remain standing to this day. Zapolya House was built in the second half of the 15th century and served as the seat of the Transylvania Diet during the 16th and 17th centuries. Today, the building houses the local History Museum, which displays Romanian and Saxon folk art, medieval weapons, traditional pottery and icons painted on glass and wood. Built in 13th century, Calnic Fortified Church is one of the most representative defensive structures in Transylvania. The Siegfried tower, the landmark of the fortress, is five stories high and is endowed with defensive corridors and firing windows. An onsite medieval art museum displays various artifacts. Daily train connections from/to a number of Romanian cities, including Bucharest, Alba Iulia, Arad, Brasov, Sibiu, Sighisoara, Targu Mures and Timisoara. You can obtain train schedule information and make reservations up to 24 hours in advance here. Tickets for same-day travel can only be purchased at the train station. For a list of accommodations in Sebes, please check our Accommodations guide.